Home How Do You Improve Bad Posture? How Do You Improve Bad Posture? Your parents probably fussed at you about your posture as a child and teen. Did you hear, “Sit up straight,” or, “Stand up straight,” on a regular basis? While we all probably experienced of well-meaning parents nagging us about our posture, many of us never realized that these warnings were important for our long-term wellness. Posture is important on two fronts; first, whether we like it or not, poor posture can affect the way people perceive you and the first impressions you make. Poor posture projects an image that many subconsciously see as apathy, lack of confidence, laziness, or simply a lack of caring. This can hurt your professional potential, as well as the ability to develop new interpersonal relationships. Beyond the social aspect, bad posture can affect your body by pulling it out of alignment and contributing to stiffness and chronic pain. A lifelong habit of bad posture leaves many adults asking, “How do you improve bad posture?” Unfortunately, this problem can progress to the point that attention and will power are not enough, and how to improve bad shoulder posture requires professional interventions. If you find that your posture problems seem to be unsolvable, it may be time to give Rolfing® Structural Integration bodywork a try. Rolfing is a process of deep tissue bodywork that addresses aberrations in your fascial system. Your fascia is the connective tissue that runs throughout your body, and it is what holds your muscles and bones together. 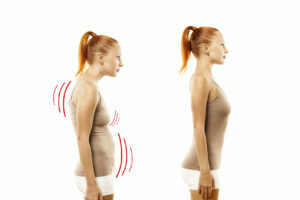 If sections become thick and fibrous, they pull your body out of alignment and contribute to continued posture problems. Rolfing corrects these issues, which brings your body back into balance. As a result, you not only will see improved posture, but also ease of movement and a feeling of increased vitality. Certified Advanced Rolfer® Bob Alonzi is often asked, “Can you improve bad posture?” Through his Los Angeles-based practice, he helps his clients recover from poor posture problems and regain a body that projects an image of pain-free personal wellness. ← Are You Struggling With Chronic Pain?